Fabric Plain férfi bomber dzsekiThis Fabric Plain Bomber Jacket is crafted with full zip fastening and long sleeves. It features ribbed trims for comfort and is a hooded 4 pocket design. 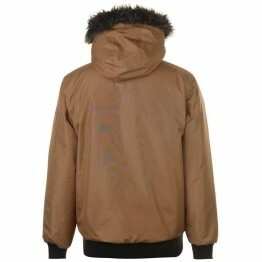 This jacket is a padded construction in a block colour and is complete with Fabric branding.> Men's jacket>.. Under Armour Reactor férfi bomber dzsekiThe Under Armour Reactor Bomber Jacket is cut with a loose fit for added comfort and benefits from UA Storm and ColdGear Technologies delivering water repellent and breathable properties.> Mens bomber jacket> Loose fit> USA Storm Technology> ColdGear Reactor I..
Lonsdale férfi bomber dzsekiThe Lonsdale Bomber Jacket features a classic bomber jacekt design comprising of full snap fastening front, long sleeves with ribbed cuffs, a ribbed hem, ribbed neck collar and two pockets. 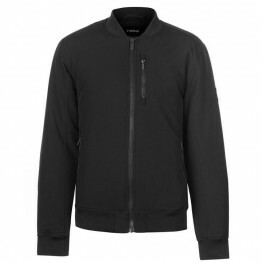 Crafted from a soft jersey fabric with brushed fleece lining, the jacket features ..
Lee Cooper Classic férfi bomber dzseki .. Fabric Ripple férfi bomber dzsekiThe Fabric Ripple Bomber Jacket has a padded body with full zip fastening, three zipped pockets plus long sleeves in a ribbed design with ribbed cuffs, a ribbed hem and ribbed neck collar. > Men's bomber jacket> Full zip fastening> Long sleeves> Ribbed sleeve cuffs> ..
Lee Cooper férfi steppelt bomber dzsekiEbből a modellből egy mérettel nagyobbat kell választani! ..
Embroidered Bomber Jacket by Firetrap Blackseal> Bomber jacket> Full popper button fastening> 2 front popper fastening pockets> Baseball collar> Ribbed trims> Large embroidered design to back> Firetrap Blackseal branding> 100% Polyester> Machine wash at 40 degrees ..
Firetrap férfi steppelt bomber dzseki The Firetrap Quilted Bomber Jacket is a stylish look that is perfect for a more casual feel. Styled with a quilted design this jacket features long sleeves with ribbed wrist cuffs and matching hemline, as well as a full length zipped fastening located to the fr..
Everlast Heavy férfi bélelt bomber dzsekiAz Everlast Heavy Bomber kabát egy lélek- és testmelegítő megoldás az Everlast-tól a hidegebb őszi és enyhébb téli napokra. Mellkasán Everlast márkajelzés található. További jellemzői: férfi bomber dzseki elől végig cipzáras magasított nyakkal kapucnis mode..
No Fear férfi steppelt bomber dzsekiThe No Fear Quilted Bomber Jacket is designed with a full zip fastening, long sleeves with ribbed sleeve cuffs, a ribbed hem, ribbed neck collar, two zip pockets to the front and one to the sleeve.The jacket includes an all over quilted design and is completed wi..
Five Street Bomber JacketThis lightweight mens bomber jacket from Five features Fives #FreeTheFuture tagline to the internal stormflap, complete with ribbed trim for a traditional look.> Mens jacket> Lightweight, bomber style> Ribbed trim> 2 way zipped pockets> Mesh lined> Machine washable ..
Firetrap férfi bomber dzsekiIdeal for the colder weather, the Firetrap Bomber Jacket is a padded construction with long sleeves and a full zip fastening. It features two zipped hand pockets and a zipped chest pocket for storage. 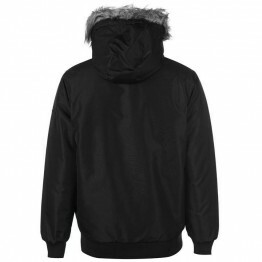 Firetrap branding completes the design.> Men's bomber jacket> Long slee..
Everlast férfi kapucnis bomber dzsekiEz az Everlast férfi kabát kényelmes, meleg mindennapi viseletre alkalmas. Bélelt kialakítása jól megvéd a hideg ellen. Zsebei praktikus tárolási lehetőséget biztosítanak. férfi kabát, télikabát férfi bomber dzseki cipzáras fazon kapucni fazon, állítható bé..
Dunlop Hi-Vis Bomber Jacket Mens Stay safe in the Dunlop Hi Vis Bomber Jacket featuring VizLite reflective stripes coupled with a fluorescent yellow design for added visibility when you’re in working environments. 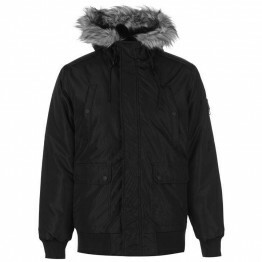 The mens safety jacket also features an adjustable, drawcord hood coupled with an elas..
NUFC Bomber Jacket Mens This NUFC Bomber Jacket is crafted with full zip fastening and long sleeves. It has ribbed trims and 2 popper fastening pockets. 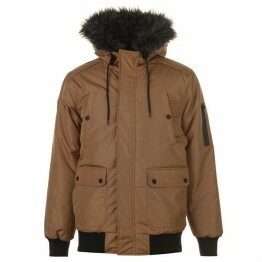 This jacket is a lightweight construction with a zip fastening pocket to the sleeve. 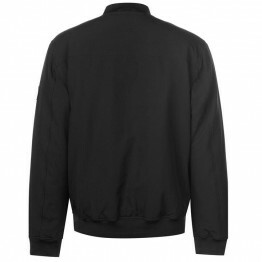 It has an embroidered club crest to the chest and is complete..
Pierre Cardin Seer férfi bomber dzseki This Pierre Cardin Seer Bomber Jacket is crafted with full zip fastening and long sleeves. It features ribbed trims for comfort as well as 2 open pockets. This jacket is a lightweight construction in an all over print design that is complete with Pierre Cardin.. Fabric Borg Bomber férfi bomber dzsekiThe Fabric Borg Bomber features classic bomber jacket style body with a zipped arm pocket, styled with a fold over collar with faux fur trim.> Mens jacket> Bomber style> Zipped arm pocket> Fold over collar> 2 front patch pockets> Knitted cuffs and hem> Quilted b..